Create a publication which captures Rotterdam's history. The architecture of Rotterdam is incredible and varied. Many visitors don’t seem to know that much of the city was rebuilt after World War II. Rotterdam: Explorations Of A City In Progress explores the history of Rotterdam in relation to its architecture. Through the book there are two narratives: the first outlines present day Rotterdam’s environment through original photographs and a curated text narrative. The second tells the events of the Rotterdam Blitz in World War II, in which most of the inner city was completely destroyed. 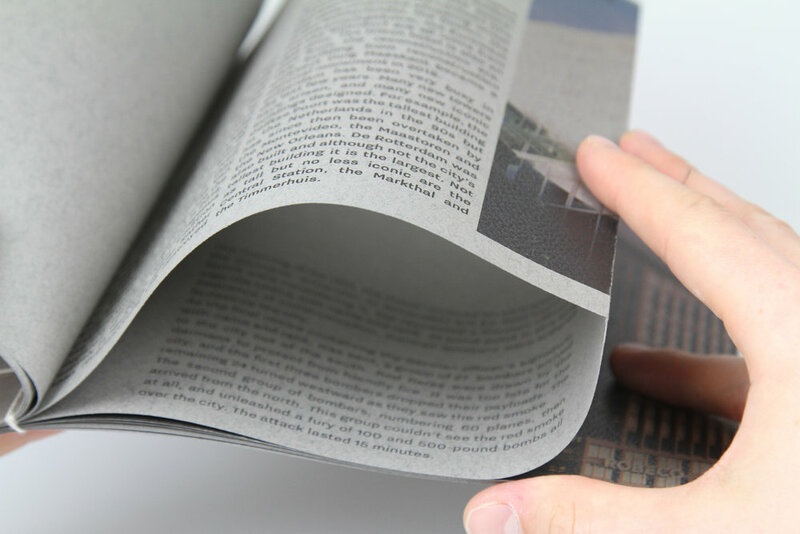 The second narrative is hidden in the folds of the pages, leaving the reader to discover each piece of history underneath the modern Rotterdam in front of them.